Hello! I apologize for the lack of posting lately. Our new little Lueckemeyer is due May 26th, but according to the doc it could be any day now. Getting things ready in time is definitely harder the second time around, I have quickly discovered. We are so excited to meet her, however, and I absolutely cannot wait for big brother to meet his little sister! 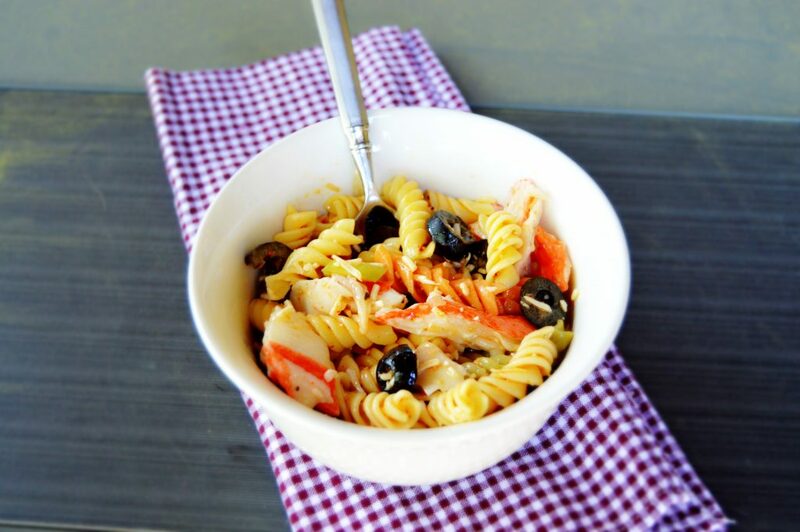 May has been busy with 3 other birthdays ( and getting ready to add a 4th to this month) and upcoming Mother’s Day, so I thought this would be the perfect opportunity to share another family favorite, my Grandmama’s Seafood Pasta Salad – a refreshingly light dish that is so simple to whip up and could really please your Mama on her special day. I also made it recently for my best friend’s baby shower and my Mama made it for my baby shower a few weeks ago. So needless to say, it’s pretty popular around here. This recipe calls for crab as it’s protein source, but if you’re like me and don’t always have the pocket book or luxury of spending hours cracking expensive crab to get that tiny bit of meat, imitation crab works wonderfully well. Imitation crab, also known as Surimi in Japanese, is made of fish (often pollock) and tastes remarkably similar, but way less expensive and convenient to use. It is a good source of protein and low fat, with a drawback of it being higher in sodium (watch portion size if this is a concern). Real crab is actually naturally higher on the sodium side too, but all in moderation and part of a varied diet as dietitians love to say. This recipe serves a batch for 6, but I always end up at least doubling it because it is a hit at parties and makes for some delicious left-overs. 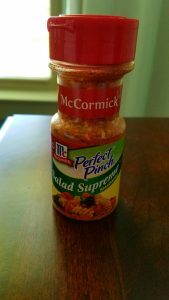 In case you were wondering what McCormick’s Salad Supreme Seasoning looks like..
1) Cook noodles per package instructions. Rinse with cold water when done. 4) Toss well. Chill overnight and it’s ready to go! I sure am looking forward to becoming a Mama of two…can’t really think of a better Mother’s Day gift. To all Mama’s out there (including mine), thank you for your unconditional love and care, and for holding the most important job in the entire world. I hope you get showered with love (and this pasta salad) on Sunday! Looks good! Will have to try – I’ll add my fav diced kale…thank you! This looks delicious. Good luck with the new babe! Mm I love all things crab! This is so perfect for summer! Love all the flavors! 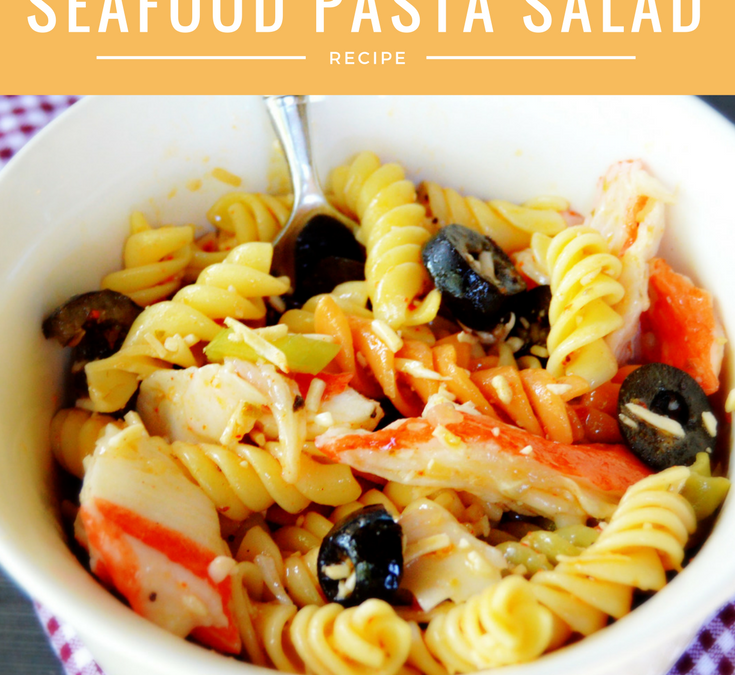 Seafood + Pasta — looks like a perfect dish for me! Thanks! They are 2 of my favorites as well! What an easy recipe! I need to try that spice–yum! Love pasta salad! They always remind me of a summer picnic! Love pasta salad!! This recipe sounds easy and delicious!